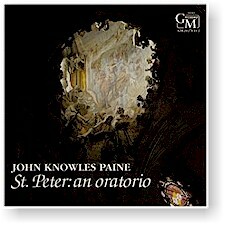 Over 115 years ago, John Knowles Paine's oratorio St Peter received its premiere in Boston's old Music Hall and was immediately heralded as a masterpiece. Paine himself, at the time, was rapidly becoming recognized as the foremost figure in a blossoming American music scene, and he is remembered today as the first American composer of international significance. After its initial performance though, St Peter inexplicably lapsed into obscurity until the efforts of Gunther Schuller and a dedicated group of assistants brought the oratorio to light again in the spring of 1989. Realized here in all its magnificence by Boston's Pro Arte Chamber Orchestra and Back Bay Chorale, as well as four of America's finest young singers, St Peter: An Oratorio speaks with a romantic eloquence and passion rarely equaled in American sacred music. (Also by John Knowles Paine on GM Recordings, his Violin Sonata in B Minor.) "Schuller's recording is a major accomplishment, both in the resurrection of the work and in the excellent production." Also available for downloads on iTunes as well as Amazon, Rhapsody, eMusic and other digital sites.